The Oconee County Board of Commissioners is scheduled to give final approval tomorrow night to loan documents that will add $5.8 million in new county debt for construction of the Hard Labor Creek Regional Reservoir in Walton County. Board of Commissioners Chairman Melvin Davis has promised county officials will provide information to the public on population projections, future water use estimates, and plans for retirement of the debt before the Board makes its decision. The county’s debt will be part of a $20 million loan package from the state of Georgia to the two counties for construction of the dam for the reservoir. It will not cover the costs of the water treatment plant or the distribution system. The debt will be on top of the $19.5 million in debt the county already has accepted for the reservoir through bond sales shortly after the county agreed to join Walton County on the project in 2007. A series of charts I have prepared show the complexity of the issue before the county and the commissioners. 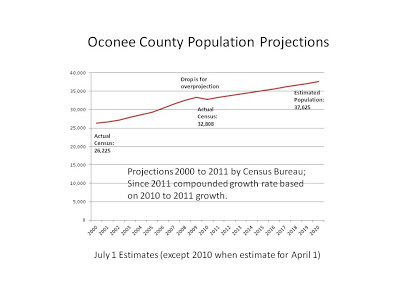 Oconee County’s population grew from the 2000 to the 2010 national census, but at a rate lower than what the Census Bureau had projected, based on estimates of births, deaths and migration into the county. The Census Bureau has projected growth of just less than 1.7 percent for the 15 months from April 1, 2010, to July 1, 2011. If the growth had been even during that 15-month period, that would indicate an annual growth rate of 1.3 percent. I used that rate, compounded, to project a population figure of 37,625 by 2020, up from the 32,808 Census Bureau figure for 2010. That would mean the county would add only about 11,400 residents in the 20 years after the turn of the century. 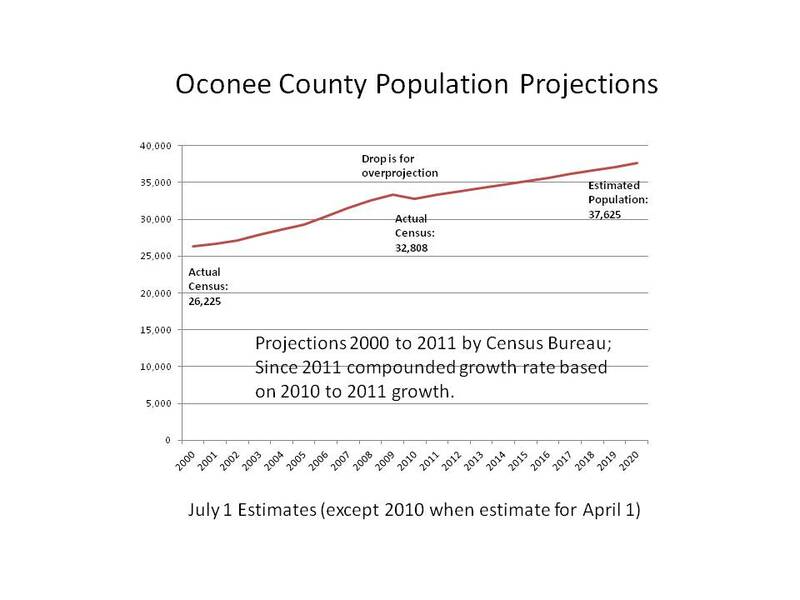 The number of water customers in the county about doubled in the years from 1990 to 2012, according to data given to me by Oconee County Utility Department Director Chris Thomas. Most of that growth was in the 1998 to 2008 period, with the county adding only 397 customers from 2008 to 2012. The county does not provide water service to the southern part of the county. Water use grew slowly from 1999 to 2005 and then skyrocketed until 2007, the period of most rapid housing growth in the county. With the drought, water restrictions, and the collapse of the housing market, water use dropped back nearly to 2005 levels in 2009 before it began to grow, somewhat erratically, again. Water sales revenue grew steadily from 1999 to 2007 and then collapsed. Revenue has increased from 2009 until 2012 because of yearly water rate increases. How the county weighs these data and others it will assemble should become clear about two-thirds of the way through the meeting, when the commissioners review the Hard Labor Creek loan under the agenda heading of Budget Items. The meeting starts at 7 p.m. in the courthouse. Click on any one of the four charts to enlarge it. The water per itself will always to secondary to the property valuations over time.